There's a lot of guitar here for the money, a successful slice of classic and contemporary. Extremely comfortable. Huge range of tones. Good build. Finish is a little delicate. Not familiar with Blade Guitars? If all things shred are of interest to you, then you should be. The Switzerland-based company has been turning out guitars built for flying fingers since the late 80s, with a tradition of blending bleeding-edge technology and classic looks. 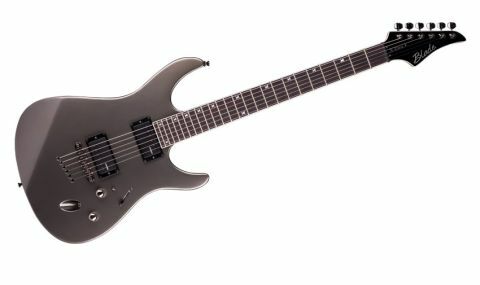 The X-Fire XF-120, which is made in the Philippines, is the latest weapons-grade guitar Blade has produced, and looks to live up to the company's reputation. "The XF-120 is all about the clean lines and ergonomic design"
Looking exactly how guitarists might have imagined guitars from the future to look in, say, 1986, the XF-120 is all about the clean lines and ergonomic design. The recessed jack socket, through-body stringing and shapely headstock all help, as does the flawless single-colour finish and 'X' fret position markers - subtle details that accentuate the overall visual style of the guitar nicely. It's a design aesthetic that carries through to every aspect of the instrument: simple but incredibly effective. On the strap, it's well balanced, with a bolt-on neck that boasts a broad, flat fingerboard that feels perfectly suited to super-charged note flurries. The two-octave neck means there's a ton of space to explore, and it's extremely comfortable to play - basically, a dream for technical players looking to melt faces. Even unplugged it resonates, and plugged in, the XF-120 reveals itself to be a beast of many stripes. A pair of Levinson humbuckers are controlled by standard tone and volume controls, a pickup selector and a smaller three-way switch, which controls the much-vaunted Variable Spectrum Control. There are three adjustable presets (which you can tinker with via holes in the access panel to the rear) that are essentially a set of EQ boosts for midrange, treble and bass. Paired with the pickup selector, it gives you access to a huge range of tones from slinky single coil to gruff humbucker. It's an incredibly handy little feature that, at times, can feel like having two or three guitars in one. Combined with the Levinson pickups, the VSC gives you a pretty broad palette to paint your, er, sound pictures with. The Levinsons are articulate and surprisingly sweet, more about Black, Blinding White clarity than brute force, although they do react well to plenty of gain, and begin to sweat a little given the right persuasion. This is built for precision players, with the build quality this kind of model suggests. It's been built ruggedly, but it's not too pricey, and it has a timelessness to it - it's pointy, but not too pointy, forward-looking while indebted to the shredders of years gone by. The downsides? Well, the finish might be a little delicate - our review guitar quickly developed buckle rash, but who knows how many dirty guitar journos have had their way with it - but past that, not a lot.